Vejigantes in Ponce's Carnival - Puerto Rico is Music! 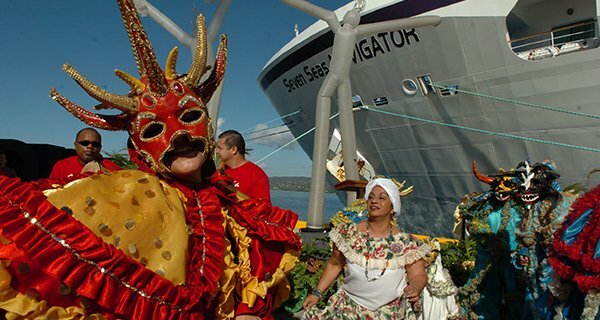 The third edition of Carnaval Comunitario de Ponce will be held from September the 10th to September the 13th. Many communities from several municipalities in the South will get together to celebrate with music, parades, vejigantes, and merry-go-rounds. Two interesting activities will be featured in this event: vegijantes and the sardine’s burial (“entierro de la sardina”). The vejigante is a folkloric character in Puerto Rican carnivals, festivals, and other events. They wear brightly colored, ornate masks of all colors and costumes with bat-like wings. The origin of the vejigantes go back to medieval Spain, when infidel Moors were defeated in a battle led by St. James. At the time, people dressed as daemons participated in processions to honor the Saint. In Puerto Rico, the tradition was enriched with the bomba and plena music. Entierro de la Sardina is a Spanish ceremony celebrating the end of carnival and other festivities. The “Burials” generally consist of a carnival parade that parodies a funeral procession and culminates with the burning of a symbolic figure, usually a representation of a sardine. Desfile saliendo desde frente al Cementerio Civil. Reconocimiento Al Gran Mariscal David Santiago Torres. Saliendo desde frente al Cementerio Municipal. Visit the Facebook page of Mayita Meléndez or the official Facebook page. Also, check this article published by La Perla del Sur. Ponce is the most populated city outside the San Juan area. The city has a colonial style, with an atmosphere charmingly laid-back in contrast to the economic and nightlife activity in San Juan. There are many attractions in Ponce, you can check some of them in Wikitravel.com. They have an excellent article that details how to get around Ponce. Ponce is known to be one of the best exposers of the vejigante tradition in Puerto Rico where you will find some of the island’s best artisans and mask-makers. © 2015 – 2017, prismusic. All rights reserved.